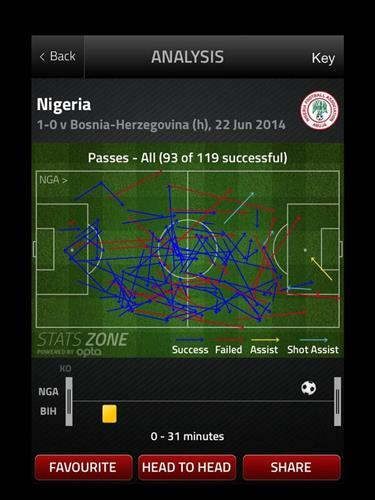 Nigeria has 7 touches in the attacking penalty area today. They had 6 in the opening draw vs Iran. Well, as it stands Bosnia-Herzegovina have 45 minutes left to save their World Cup dreams - although they should, undoubtedly, have been ahead after Edin Dzeko's goal was incorrectly ruled out. As this tournament has so often proved though, it's what you do in spite of adversity that decides games, and Nigeria have grown in strength with Peter Odemwingie's goal. The Golden Lilies are wilting, and Safet Sušić needs to put some fear into them at the interval. @George james...I think they were trying to rest their legs for the next half. I think they were also doing it to kill the half. Bosnia lose or draw and are done. Can only get a point from Iran. Breet, I agree - the one danger for Nigeria is that they look loose at the back, and are affording therir opponents plenty of space. They need to tighten it up. The Super Eagles' official Twitter account says it better than I ever could. Victor, it would be harsh, but if they allow a moment like that to define their matches, then they're not cut out for elite competitions. To be fair, while Dzeko has been wasteful, at least he's trying. Aside from Pjanic, his teammates have done absolutely nothing. Edin Dzeko has 4 touches in the attacking penalty area today. Dzeko had 0 against Argentina. Our man Colin Udoh has some choice thoughts about John Obi Mikel's mobility. Brett, please explain how Dzeko squandered the ball he put in the back of the net. Taka Tiki checking in from the bar. I love you Boot Room!!!! Taking a look at the replay again,absolutely right decision for the goal.And yes,wrong on the Dzeko goal.That was no off side.Efe Ambrose was playing Dzeko onside. Eskimo, absolutely buried it. But how many poor shots and bad touches has he had? He should have 2 if not 3 goals already. Tom, am I wrong? Brett, he's been wasteful, but he's such a threat down that flank. Lots of hungover Germans around me. They seem both relieved and disappointed. Mixed emotions. which would be more of a shock tom.. mikel scoring or ameobi scoring.. or worse.. one of them assist the other? Bristolian, I'd have to say Mikel. @sp , no luck needed when there is a Messi . That was not a lucky goal. Such a shame that was incorrectly called, but Bosnia is starting to get their legs under them. Hopefully a breakthrough for them will come soon.